May 4, 2019 (Sat) - 15th Annual San Diego Dragon Boat Festival at Tecolote Shores Park in Mission Bay from 9AM - 4PM. Come out to this family-friendly event and enjoy watching local community teams compete in dragon boat racing! There are food vendors and cultural performances throughout the day. What is dragon boat? May 4, 2019 (Sat) - 10th Annual Asian Cultural Festival of San Diego 2019 at Mira Mesa Park and Recreation Center from 10AM - 5PM. Family-friendly, fun, and FREE admission! Cosplay Contest! Happy New Year of the Pig 2019! 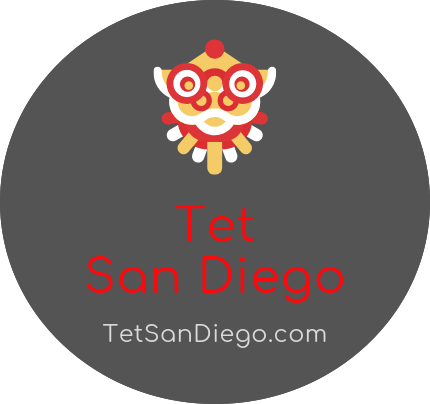 The Tet San Diego website lists Vietnamese New Year festivals that happen in San Diego during the Vietnamese New Year. Take advantage of the festivities and immerse yourself into a weekend full of Vietnamese food, dancing, games and fun! Many cities don't have this luxury. San Diego is truly lucky. Usually the Vietnamese New Year, also called "Tet", takes place between 1 - 2 months after the American New Year's Day. Scroll to see all locations. More locations will be featured once festivities have been confirmed. Buy "li xi" red envelopes online! Here are the locations of where you will find the Lunar New Year festivals in San Diego. Scroll down for more info. Celebrate the YEAR OF THE PIG with San Diego's choice, 3-day festival, dragon and lion dances, firecrackers, games, ASIAN FOOD, FESTIVAL FOOD and more! Bring your cameras, your kids, your piglets and be ready food, folks and fun! Tickets are $6 for adults and $4 for kids under 13. This is a big annual tet festival in San Diego. Admission is FREE. There is always a large list of Vietnamese food vendors that will satisfy your taste buds. Come see the lion dance, fireworks and the pageant, as well as, other live entertainment. Free admission! Come celebrate the Lunar New Year 2019 at the International Cottages with House of China, Located in Balboa Park. This is a 2 day event! House of China located in the International Cottages, Balboa Park is hosting it's special Chinese New Year Festival. Come see Chinese Culture and performances at the festival. This is a family-friendly event and it is free to the public. There will be Chinese craft vendors along with Ethnic Specialty foods. Celebrate Chinese New Year with Kung-Fu, Lion Dance, Red Envelope, Dumplings, Steamed Buns, Calligraphy, and Ethnic Dance Performances. For GPS, use address: 428 3rd Ave, San Diego, CA 92101. The fair will be held on February 16 and 17, 2019 in the Asian Thematic Historic District, on Third Avenue and J Street in Downtown San Diego. This 2 day event is free to attend! Just park in a parking structure in downtown and walk there. Make it a fun downtown day adventure!